I made this twice for dinner last week! I'm trying to eat a bit healthier to get the rest of my baby fat off! 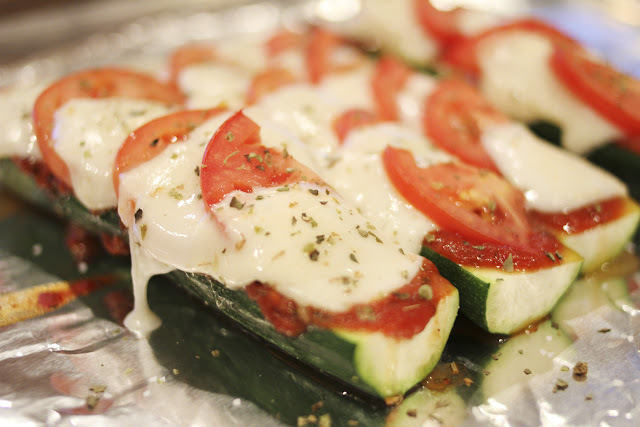 A healthy and super yummy alternative to traditional pizza! I promise you, the flavor was so good, I didn't miss the bread! All you need is a zucchini cut in half horizontally, your fav pizza sauce, fresh mozzarella cheese(sliced), roma tomatoes(sliced) and a little italian herb blend to top it off! In the oven for 15 minutes until zucchini is slightly tender and voila!!!!! Big on flavor...not on carbs!